The New Jersey Civil Justice Institute has partnered with the United States Chamber of Commerce to file a friend of the court brief in a lawsuit that will answer this question. However, as you may have guessed, this lawsuit is about much more than flooring. 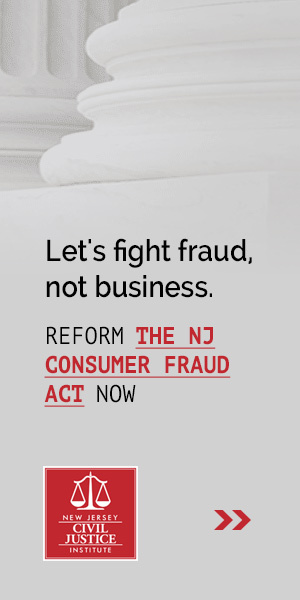 This lawsuit could be the key to stopping out-of-control regulatory enforcement litigation under New Jersey’s Truth-in-Consumer Contract, Warranty and Notice Act. The case, Kaufman v. Lumber Liquidators, involves plaintiffs who suffered no actual harm. Rather they are suing because the invoice they received when they purchased hardwood flooring from the defendant did not include what they believe should be statutorily required information about delivery dates and seller’s obligations in the case of delayed delivery. The plaintiffs allege that not including that information is a violation of New Jersey’s Delivery of Household Furniture and Furnishings Regulations (Furniture Delivery Regulations) as well as the state’s Truth-in-Consumer Contract, Warranty and Notice Act (TCCWNA). The plaintiffs are arguing that hardwood flooring should be classified as “household furniture” and thus be subject to the Furniture Delivery Regulations. Their reasoning is that the definition of “household furniture” specifically includes “carpets,” which is a lot like wall to wall carpeting, which is pretty much the same thing as hardwood flooring. The plaintiffs then argue that if the defendant was in violation of the Furniture Delivery Regulations, they were also automatically in violation of TCCWNA. TCCWNA is a consumer protection statute that is intended to deter sellers from including in their consumer contracts provisions that violate the rights of consumers, because their inclusion could discourage unknowing consumers from enforcing their rights even if the provisions themselves were unenforceable in court. Sellers who are found to have violated TCCWNA are subject to a statutory penalty of $100, regardless of whether the consumer suffered any actual injury or whether the seller acted with ill intent. The plaintiffs in this case are not just seeking $100 dollars though. They filed this case as a class action on behalf of all Lumber Liquidators’ customers who purchased hardwood flooring for delivery between September 4, 2008 and September 4, 2014. Each of those customers’ claims would be valued at $100, plus Lumber Liquidators would be on the hook for the plaintiffs’ attorneys’ fees, so a substantial amount of money is at stake. 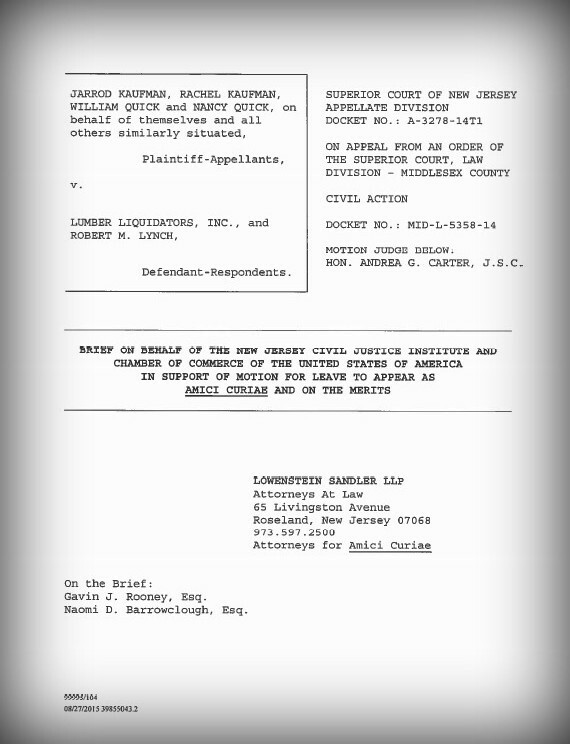 Rather than settling, Lumber Liquidators is choosing to fight this litigation, and NJCJI and the U.S. Chamber are joining in as amici because we don’t think that a violation of the Furniture Delivery Regulations, or any other regulatory system, should automatically be considered a violation of TCCWNA. No seller, lessor, creditor, lender or bailee shall in the course of his business . . . enter into any written consumer contract . . . which includes any provision that violates any clearly established legal right of a consumer or responsibility of a seller, lessor, creditor, lender or bailee as established by State or Federal law at the time . . . the consumer contract is signed . . . .
must be a settled one that is “beyond debate,” such that “any reasonable” seller would be on notice that the provision is prohibited. Accordingly, the right must be clear and unambiguous on the face of the statute at issue or under controlling and dispositive decisional law. Moreover, the right must be settled at the time that the contractual provision is entered into; subsequent case law or statutes cannot suffice. Only if these requirements are met will the seller have fair warning of what kind of provisions may invoke penalty damages under TCCWNA. The novelty of the plaintiffs’ argument – that hardwood flooring should fall under the definition of “household furniture” – indicates that this law is not a clearly established legal right. Click here to read our full brief, which was authored by Gavin J. Rooney and Naomi D. Barrowclough of Lowenstein Sandler.